In my continuing effort to ward off the Tight-Pants Monster, I have been trying out lots of new recipes and snacks. I love granola bars, but have realized that a lot of them have many mysterious ingredients. Since one of my goals is to eat less processed food, I wanted to see if I could find an alternative! 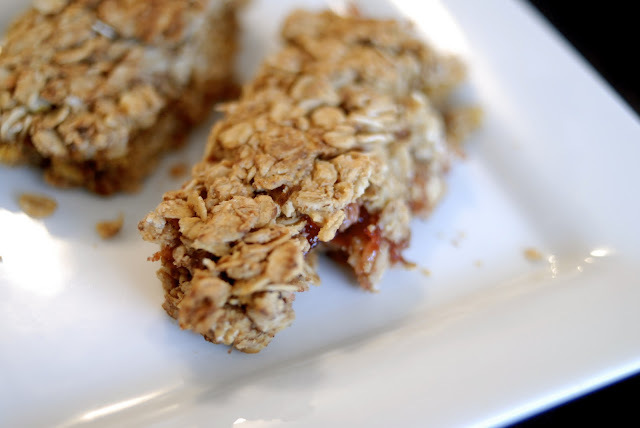 So, I went and browsed Pintrest for a simple, basic, and healthy granola bar recipe. Fortunately, the granola bars were a success! I do think, however, that I'll add just a touch more honey next time or do a better job of squishing them in the pan. They do stick together, but I'd like them to be a little less crumbly! Otherwise, they are soft, yummy, and I can pronounce all the ingredients! Mix all dry ingredients together. Add honey. Melt peanut butter and pour into the bowl. Mix it up well and make sure it is well-moisened If you want, you could add some other nuts or chocolate! If you do, you may need to add more honey or peanut butter (by tablespoon) until the mixture is nice and moist. Place parchment paper into a 9x13 baking dish (or greased pan). Press half of the mixture firmly into the pan. Add a thin layer of the fruit preserves (I used fig/strawberry preserves! ), add the remaining mixture to the top and press firmly. Bake for 20-25 minutes. Cool. Cut. Eat up! I got 12 good sized granola bars out of the mix, plus some extra crumbs that are super yummy in yogurt! After they cooled, I wrapped them up in tin foil and then put them into a little snack baggie for an on-the-go snack. I'm excited to make them again and try a chocolate version! Or maybe something with pumpkin...the possibilities are endless!